If you’ve been reading our blog, you know that PPC isn’t something you can just pick up and do like a pro. It’s complicated, and it takes practice and lots of reading to even start to build the right campaign for your business. That’s why we have all of these PPC guides for you, so that you won’t suffer from these common mistakes real estate investors make with PPC. 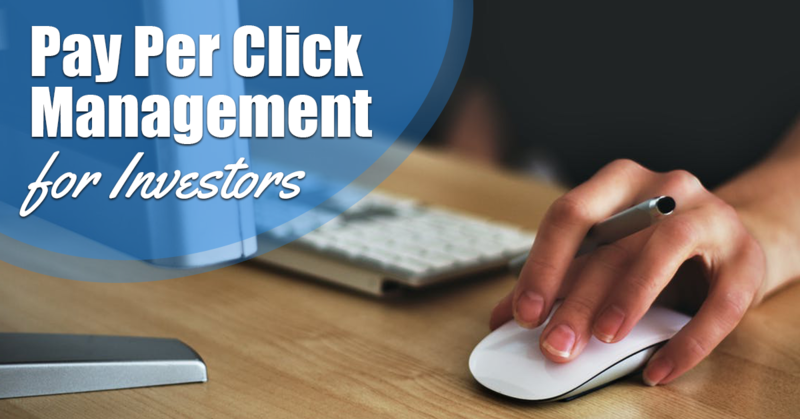 First thing’s first, if you haven’t gone over our pay per click guide for real estate investors yet, take a look! It has a lot of helpful tips for how you can be getting high quality traffic without spending an arm and a leg. As for today, we’re talking about the common mistakes real estate investors make with PPC and how you can avoid making those exact mistakes so that you’re not wasting your money on paid advertising. We’ll go through each mistake, talk about what it is, and tell you a quick way to fix that problem! It goes without saying that your business’s name is most likely your highest converting keyword. With all of your on-page SEO, content marketing, and local citations, it would be amazing if it wasn’t your highest converting keyword. That being said, one of the mistakes real estate investors make with PPC is assuming that they don’t need to bid on their own name. Not true. Often times, competitors will target your company name as a keyword to prevent you from getting traffic and leads. If that’s happening, you need to take legal action. If it’s not, then bidding on your own name is still useful. You’ll pay somewhere around 0.05 – 0.10 cents per click on your company name, which isn’t that much. Once you start bidding for it, you can track extra statistics of how much your company is growing. Remember, you want to keep good metrics of your real estate investing company’s growth so that you can change your strategies as needed. Just like in SEO, you don’t need to be the number 1 in PPC. With SEO, it’s because the number 1 search results isn’t the only one with high enough CTR to be significant. With PPC, it’s because the number 1 spot is often the most expensive without being the most converting. 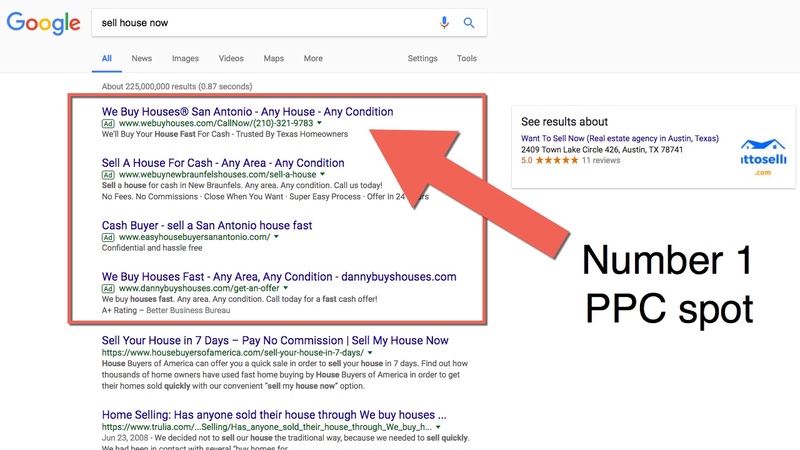 One of the biggest mistakes real estate investors make with PPC is fighting for the number 1 spot on a Google search result. The problem with the number 1 spot is that you’re not always getting quality clicks from it. More often than not, the clicks from the number 1 paid result comes from searchers who didn’t type in the right keyword and quickly click the first thing they see. This is an issue because you’re paying more money to be that number 1 result, but getting clicks for people who aren’t actually looking for your service. It’s wasting your money. The best place to be, actually, is the number 3 result. Being the third ranking result is more converting because the searchers tend to read their options before clicking on that link. Meaning, the clicks you get are more legitimate because that searcher sought out your link. This mistake is simple to fix, and pretty self explanatory. Basically, just put your keywords into the ad copy that you’re serving your ad. This will make your ad much more relevant in searches, and keep your keywords front and center. However, those are pretty broad. They aren’t a bad thing to be ranking for, but you shouldn’t be spending too much money bidding on such a broad keyword. You’ll be fighting with a lot of other real estate investors, and will end up spending too much money for that keyword spot. A better strategy is to focus on what’s called a “long tail keyword“. This is the more specific search terms that your target audience will be typing, but more importantly bidding on these is much cheaper than bidding for broad terms. The best way to find which long tail keywords to bid on and use is by going to your website statistics for which keyword variations your audience is using to find your business. We already know that landing pages are important for online conversion – which is the whole point of having a website – but if you’re losing people on your landing pages then they aren’t doing their job right. 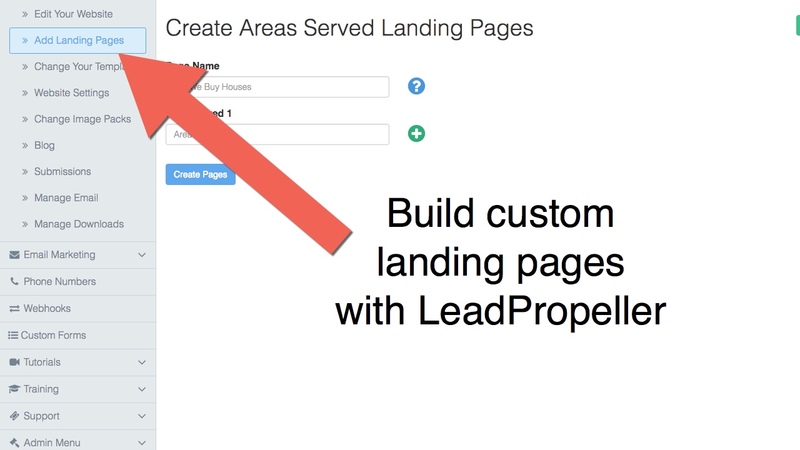 Not to be a plug-in, but if you’re a LeadPropeller customer then your landing pages are already built to be high converting, so there’s no problem there. Common mistakes real estate investors make with PPC when it comes to landing pages is that they’re not relevant to the ad. The simple fix for this is the repeat when your ad said right on your landing page. Think of it from your audience’s point of view. If you click on a link that says “Sell your house as-is” and are taken to a page that doesn’t have that phrase on it anywhere, you’ll feel like the two aren’t connected. As long as you stay consistent, then your ads and landing pages will convert and get you leads. CTR, or click through rate, is something we’ve gone over in the past, so you already know it’s key for SEO and PPC. There is a huge difference between CTR and Conversion Rates, though. CTR is the number of clicks your page received, divided by the number of times your page is seen. Conversion Rate is the percentage of users who take a desired action. In the case of your real estate investing business, a conversion is tracked when a visitor submits their information to you to start the lead process. Knowing the fundamental differences in these two things is important for tracking ad success in tests. Your CTR determines the relevancy to your audience while your conversion rate tracks the overall success of your ad. Don’t mistake the two when you’re looking at the analytics. If you’re not tracking what’s happening in your ads or on your website, then how will you know what’s working and what’s wasting your money? Especially with PPC, you always want to keep an eye on your tracking. If you let an ad run away it could cost you thousands of dollars. You can easily track every visit to your site from your PPC campaigns by which keyword was searched and clicked on. Set variables with your website’s analytics to track it with something along the lines of: yourcompany.com/?keyword. This will keep you informed on which keywords are getting traffic and converting for you so you don’t put money behind the wrong bids. If this is all too overwhelming, or just not making sense, we understand. As a real estate investor you’re an expert at buying and selling houses, not online marketing. PPC is difficult to master, and these mistakes real estate investors make with PPC are costly and time consuming, ultimately hurting your business. The good news is, there’s an easy fix for these problems! 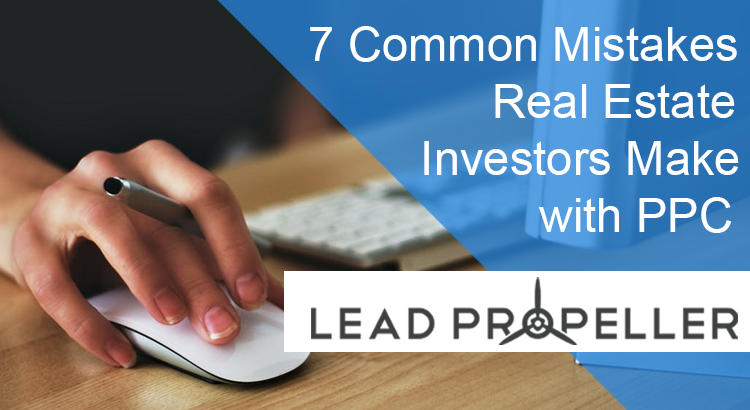 At LeadPropeller, we have professional PPC management services that are built exclusively for real estate investors. We work one-on-one with you to craft the best possible PPC campaigns so that you’re generating leads, not wasting money. You’ll get reports on how your ads are doing, what’s converting the best for you, and how many leads you’re getting from our service. That way, you’ll know exactly where your money is going, and how much more money you’re making. This service has been tested, and proven to work, all from the success of our clients. Get your managed PPC service today by visiting our site, or giving us a call at (210) 999 – 5187.